The Labrador is considered the most popular breed of dog (by registered ownership) in the world, and is by a large margin the most popular breed by registration in the United States (since 1991) the United Kingdom, Poland, and several other countries. It is also the most popular breed of assistance dog in the United States, Australia, and many other countries, as well as being widely used by police and other official bodies for their detection and working abilities. They are exceptionally affable, gentle, intelligent, energetic and good natured, making them both excellent companions and working dogs. These dogs are loyal and great with little children. With training, the Lab is one of the most dependable, obedient and multi-talented breeds in the world. The history of the Labrador Retriever can be traced definitely back to the late 1700’s in Newfoundland. At that time there were two breeds, the Greater Newfoundland and the Lesser Newfoundland. These two breeds of Newfoundland’s were also known as the Greater and Lesser St. John’s dogs. The Greater Newfoundland was used primarily for physical work – pulling around carts loaded with fish. They were the larger of the two breeds and possessed a long thick coat. The Lesser Newfoundland was a smooth coated black dog, that was unrivaled for hardiness and stamina. These dogs were the constant companions of the fishermen of the Labrador Sea. After a hard day’s work, which would sometimes last twenty hours, one could find these Lesser Newfoundland’s playing with the children of the fisherman. The Labrador has a dense, short coat that repels water and provides great resistance to the cold and water. 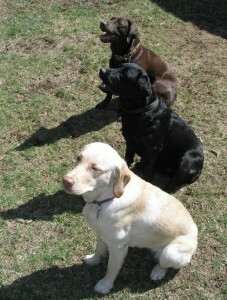 Labradors come in 3 colors; black, yellow and chocolate. Black is the most well known color and it is dominant in Labradors. Labradors have a reputation as a very mellow breed and an excellent family dog (including a good reputation with children of all ages and other animals). Labradors mature at around three years of age; before this time they can have a significant degree of puppyish energy, often mislabeled as being hyperactive. Reflecting their retrieving bloodlines, almost every Lab loves playing in water or swimming. Although they will sometimes bark at noise, especially a degree of “alarm barking” when there is noise from unseen sources, Labs are not on the whole noisy or territorial, and are often very easygoing and trusting with strangers, and therefore are not usually suitable as guard dogs.